Dandruff and Hair Loss - Is There a Connection? Dandruff And Hair Loss: What’s the Link? Dandruff is both annoying and instantly recognisable, with its tell-tale white flecks sitting on your shoulders, and covering your pillowcase in the mornings. 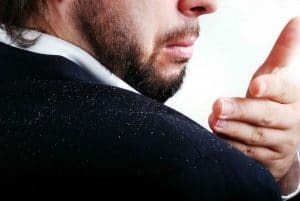 A fairly common condition, dandruff is not necessarily harmful on its own, but it could be a sign of something more serious. Dandruff usually occurs around the scalp, and presents itself as skin cells that shed and linger on the hair, or otherwise fall off. Our bodies constantly regenerate skin tissue and shed the excess – this is what keeps our skin strong and tight. Dandruff is different from our body’s normal skin shedding process, as it is composed of much larger skin cells that fall off faster, and in larger amounts. What is interesting is that a lot of the causes of dandruff are also causes of hair loss – so is there a relationship? How Are Dandruff And Hair Loss Related? Firstly, dandruff does not have any other serious health implications. It is just unsightly and annoying, and fairly easy to treat once diagnosed properly. But, dandruff and hair loss (and thinning) overlap for a lot of men and women – and improper care can make hair loss more prominent. For example, the itchiness that often comes with dandruff can cause people to scratch their hair and damage the follicles, thereby leading to hair loss. For this reason, it is best to avoid scratching, as it does not help your dandruff and only makes your skin worse. More importantly, dandruff could be a sign that the skin around the crown is not as healthy as it should be; it could be receiving harmful chemicals from a harsh shampoo, or it could be a sign that the blood flow around the scalp is compromised. If this continues for a long period of time, you could risk permanently damaging hair follicles, thereby preventing healthy hair growth. It is therefore important to find the right shampoo for your skin and maintenance routine. In any case, a trichologist can help diagnose whatever may be afflicting your hair, and prescribe medication or anti-dandruff shampoos to help alleviate the symptoms. It can be difficult to know what the best treatment options are. Our hair surgery can give you back the hair you want, so whether it is for your hairline or your scalp, take the plunge today and take control of your hair.